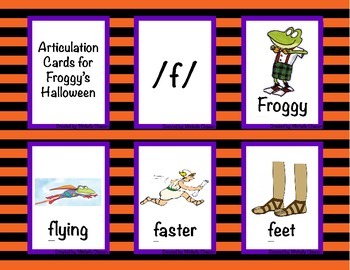 **Articulation Flash Cards: including sounds /f/, /s/, /s/ blends, /k/, and /sh/. 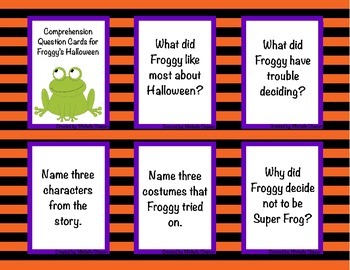 **Reading Comprehension Flash Cards: Comprehension questions to go with the entire story, both inferential and factual questions. Use these cards for drill or game play. See game board in packet! 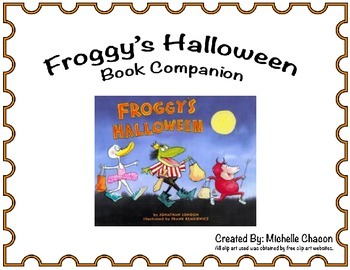 **Describing Froggy's Costume: Your students can make a list of the items Froggy might need for each costume and can draw a picture. Have your students share their ideas by describing the costume to a group. **Plan a Halloween Party: Students can form lists of what is needed to plan a party, who should be invited, and can classify these items into 5 separate categories. 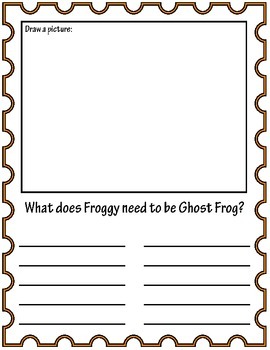 Have your students design party invitations for a quick art lesson and write/share a story about what their party or Froggy's party might be like. **Verb Sort: A list of all verbs in the story is included, have your students sort the verbs by past, present, and future tenses. Also, use the included worksheets to have your students decipher the verbs of your choice into past, present, and future. **Jack-o-Lantern Craftivity: Have your students complete a simple craft using just a paper plate, paint, and construction paper. Decorate your classroom or therapy room with the students work for Halloween week!